*This is based on the 01/09 edition of the Water Back-Up Form (HO 04 84). Changes to the 06/12 edition limits coverage to water which originates from within the dwelling. We have previously mentioned the need for the backup of sewer & drain endorsement. Raleigh's short lived disposal ban reflects the growing problem in our area that is not covered on a standard homeowners insurance policy. 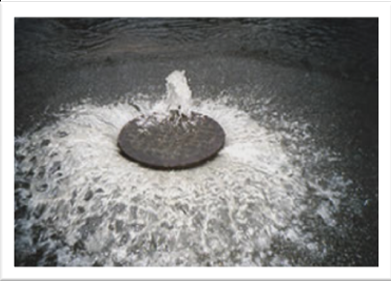 Blockages in the sewage system can cause sewage water to back up in the drains and into your home. Both the damage done by the sewage and the cost to clean it up are excluded on the standard Homeowners policy. This can leave you with a terrible mess that may cost you thousands. The sewer drains are not the only place we have seen an issue. A child's toy was thrown onto the roof and made it into the gutter. This caused a blockage during the next storm and the water that was unable to exit through the gutter found its way back up under the drip edge and emptied into the house. On a standard homeowners policy, the water damage to property inside the building would only be covered if the water entering the house came in through an opening in the roof of wall caused by the storm. Since the storm did not cause damage to the roof where the water entered, the claim was denied because they did not have this endorsement. The Backup of Sewer & Drain Endorsement can be added to many standard homeowners policies for under $50.